I've had a good feeling about Spinning Silver ever since I first heard it would be a thing. That might sound a touch ubiquitous, because basically everyone I know has been on absolute tenterhooks waiting for its release from the moment they finished Uprooted. The thing is, I read Uprooted back when it came out and the hype was huge. And the writing was truly beautiful, beautiful in a timeless way. 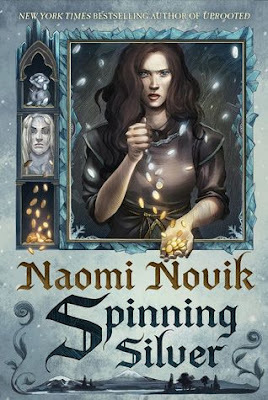 Naomi Novik is a consummate world builder and a frightfully skilled storyteller. That combined with her homage to Robin McKinley's Luthe (and Damar in general) guaranteed I would be picking up her next volume. But it's worth stating that I was comparatively underwhelmed by the characterization in Uprooted. A persistent, somewhat chilly chasm separated me from them emotionally. And so a measure of apprehension did color my anticipation for her next standalone fairy tale retelling. However. That good feeling I mentioned earlier? It lingered invitingly. Somehow, I just knew this one would be the one. I was not wrong. I had never felt sorry for the miller's daughter before, in the story the villagers told; I'd been sorry for my father, and myself, and angry. But who would really like it, after all, to be married to a king who'd as cheerfully have cut off your head if you didn't spin his straw into gold? I didn't want to be the Staryk's queen any more than I wanted to be his slave, or frozen into ice. Miryem is forced into action by her tenderhearted father and increasingly ill mother. Growing up, she watched her moneylending father try and fail and try and fail to collect what he was owed. And so her small family went without in the bitter cold winters while she was forced to watch the people of her village, those who continued to borrow from her father and refuse to pay him back, live in contentment and ease. No more. Stiffening her spine and forcing her heart to harden, Miryem takes up the reins of the family business and begins to collect on every debt. To her parents' surprise (and, at times, dismay), she is unequivocally successful. Due to her swift economizing and unsentimental actions, the fabric of their small world changes. Their cottage is warm, her mother is nursed back to health, they have stacks of silver coins, enough to trade for gold ones, enough to place in her grandfather's vault and save against a bitter day. A bitter day they are all certain will come, as the mystical Staryk who live parallel to humans (and who crave nothing more than gold) are encroaching farther and farther upon their lands, leaving their icy chill and their disdain for human life dripping in their wake. It is not long before word of a girl who can turn silver to gold spreads throughout the land, reaching not only the ear of the tsar himself, but that of the feared Staryk lord. And soon Miryem's life is unwittingly bound up with the lives of two other young women who have been similarly caged and forced to strike out in the name of survival. This is a perfect book. I just wanted to get that out there from the start. This book? It is a finely wrought marvel, and I want to hold it tight at all times. Spinning Silver is a retelling of the Rumpelstiltskin fairy tale that focuses on the nuances of truth and honor, strength and autonomy. As in Uprooted, Ms. Novik displays just how well she understands the price we humans (and her wonderfully imagined fey and demonic corollaries) pay when we sacrifice portions of our humanity on unworthy altars, when we willfully (or even unintentionally) trespass on others' agency, twisting it to fit our conceptions of what should be. Equally beautiful (if heartbreaking) is her treatment of the sacrifices we make to maintain our dignity, to stay alive, to turn away others' ill treatment and not absorb it, to keep going when the way is dark and no alternatives are good ones. It is breathtaking, her capturing of humanity in all its indecencies and simple, longing truths. At first, Miryem may seem as cold as she makes herself be. But, as always, the truth is more than what we see with our eyes. Her interactions with the woman Wanda, who Miryem extracts from a hellish environment, and employs at her own home (along with Wanda's two brothers Sergey and Stepon), as well as her escalating sparring with the Staryk lord who comes demanding gold, perfectly highlight the straight and unbending line she has made of her life. As has the third woman, Irina, who is forced into a marriage that is literally designed to kill her. She chooses life, for just as long as she can. She chooses not bending or giving in. From all the terrible choices available to her, she continues to move forward and choose and employ her agency when and how she can. You can't want to marry me. What will anyone think?" His mouth grew even more displeased and his eyes knived. "What I have promised, I will do," he hissed at me, "though all the world will end for it. Have you my silver changed for gold?" He didn't even sound malicious this time, as though he'd give up hope of my failing. I bent down and seized the lid of the casket and threw it open where it stood amid the coats and woolen wraps; I could not even have pushed it to his feet by myself. "There!" I said. "Take it, and leave me alone; it's only nonsense, to marry me when you don't want to, and I don't want to. Why didn't you just promise me a trifle?" "Only a mortal could speak so of offering false coin, and returning little for much," he said, contempt dripping, and I glared at him, glad to be angry instead of afraid. "My account books are clean," I said, "and I don't call it a reward to be dragged from my home and my family." "Reward?" the Staryk said. "Who are you to me, that I should reward you? You are the one who demanded fair return for a proven gift of high magic; did you think I would degrade myself by pretending to be one of the low, unable to match it? I am the lord of the glass mountain, not some nameless wight, and I leave no debts unpaid. You are thrice proven, thrice true―no matter by what unnatural chance," he added, sounding unreasonably bitter about it, "―and I shall not prove false myself, whatever the cost. Did the tsar refuse to marry you?" I asked. I thought the duke might have been angry with her if he had: he hadn't seemed like a man to be satisfied if his plans went awry. "No," she said. "I am tsarina. For as long as I live." She said it dryly, as if she didn't expect that to last long. "The tsar is a black sorcerer. He is possessed by a demon of flame that wants to devour me." I laughed; I couldn't help it. It wasn't mirth, it was bitterness. "So the fairy silver brought you a monster of fire for a husband, and me a monster of ice. We should put them in a room together and let them make us both widows. Though their actual paths cross but rarely, this exchange occurs at such an ideal moment. A brief, protected moment of catharsis before these two women take up their swords again and press on. I can't tell you how it turns out. I can't tell you how and when and if each of these dear characters make it out alive or intact or resembling themselves in any ways that count. All I can tell you is that Naomi Novik made everything count. There were no wasted words, no faults in the line of her tale, no mote of disappointment to be found anywhere in me when I came to the final perfect line and said to myself and the universe, "Yes." I reached out my hands to them, suddenly: I put out my hand to Sergey on one side, and to Stepon on the other, and they put out their hands to me, and to each other, and we held tight, tight; we made a circle together, my brothers and me, around the food that we had been given, and there was no wolf in the room. I just tried to put a hold on this at the library. I'm 38th in line! Thanks for the review. I love fairytale retellings. 38th in line! Wowzers. I hope the line moves along quickly for you. Fairy tale retellings are just the best, aren't they? I hope you enjoy this one.